In case you haven’t been following the news, a variety of changes to tax law in the United States went into effect last year. The resulting impact on Church of God ministers and congregations must not be ignored. Pastor, are you aware of how the legislation effects minister’s taxes? Has your church accountant considered the tax law changes and what they mean for IRS reporting? Thanks to Church of God Ministries’ partnership with ECFA through ChurchEXCEL, Church of God congregations are already taking advantage of online access to everything you need to know about minister’s taxes and church reporting—absolutely free. In September, Church of God Ministries announced a partnership with ECFA, made possible by the Lilly Endowment. In connection with Servant Solutions and Clergy Advocacy and Resource Effort (CARE), ministers and churches have a plethora of formerly inaccessible resources at their fingertips. Within days of the news breaking across the Church of God, new users of the ChurchEXCEL website spiked, demonstrating the widespread need for tools and training related to church and ministry finances. While the information may seem dry to some pastors and church leaders, no one can escape the impact of the 2018 tax reform. 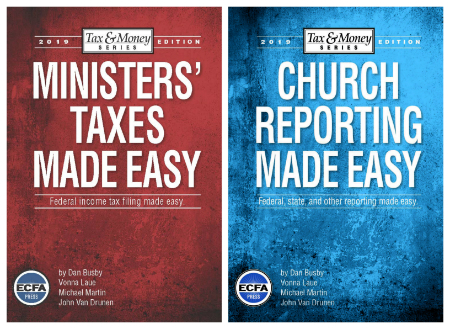 The 2019 editions of two e-books, Minister’s Taxes Made Easy and Church Reporting Made Easy are now available for free download on ChurchEXCEL. These guidebooks have been produced for twenty-eight consecutive years and are written by four CPAs, two of which are also attorneys. All you have to do is create an account and login at http://www.churchexcel.org/chogresources. Once logged in, you’ll also note a live webinar coming soon on Tuesday, January 29, at 1:00 PM EST. Dan Busby and Michael Martin, two of the books’ authors, will present the material. Also available on ChurchEXCEL are other tools like webinars on-demand, other e-books, tax guides, interactive training courses, podcasts, a newsletter, an online toolbox of resources, and a library of articles, sample policies, and procedures. When it comes to church accounting and reporting, budgeting, board oversight, housing allowance, and numerous other topics, there is help only a few clicks away! Don’t want to access it via a browser? No problem. The ChurchEXCEL mobile app is now available for both iPhone and Android. Too often, pastors and churches ignore financial problems until it’s too late. Not only can tax hurdles become a legal mess, but pastors and churches may also find themselves at a financial disadvantage—simply because they aren’t equipped with the facts and resources. Through CARE and ChurchEXCEL, the options are plentiful for the Church of God to get in good financial shape. If your church needs to make some improvements, you’re not alone, and you have no need to fear the process of making things right. Sign up for your free account today at http://www.churchexcel.org/chogresources. This entry was posted in All Church of God, Church of God Ministries and tagged accountant, accounting, administration, CARE, church administration, Church of God Ministries, churches, ChurchExcel, congregations, donors, ECFA, finances, financial, free, Jennifer Neal, minister's taxes, ministers, ministry taxes, money, resources, Ryan Harter, secretarial, secretary, Servant Solutions, tax, tax changes, tax law, tax refunds, tax returns, taxes, tools, webinar. Bookmark the permalink.